Dear comrades, we are gathered today to celebrate 50 years of ongoing struggle for the Communist Party of the Philippines. This is an event of special importance, because it shows the success of genuine communists in the reconstitution of a Party in their State. It also proves that under a correct ideology and leadership, this Party can advance on the path of revolution through the ongoing People’s War against the bureaucratic-landlord State of the Philippines and its armed forces, client of imperialist powers. The Party, leading the People’s Army is advancing with the United Front for the democratic revolution and liberation from imperialism, on the path to socialism for communism. Through our common ideology, Marxism-Leninism-Maoism, we understand the struggle led by the Communist Party of the Philippines as one of great importance for communists and revolutionaries all around the world who prepare and lead the struggle to make imperialist powers crumble and to open the way for communism. In the French State, our Party is still young, we will only celebrate the 3rd birthday of the unification of the communists in the beginning of next year. Through our more experienced comrades, our struggles of today are indubitably linked to the struggles of the past. Our beloved Comrade Pierre, who passed away a year ago, was one of the very few to always try to raise the red flag in the dark during the decades when a Communist Party was desperately lacking in the French State. His fight from 1968 to his death for the revival of communism in the State he lived in is a solid inspiration for all our young comrades. With these solid roots from decades and centuries of struggle in the French State, we hold firm on the young foundations of our Party. Still, because we are celebrating an anniversary, and because we are a young Party, we want to underline one thing with the Communist Party of the Philippines, and that is, the protracted nature of its struggle. 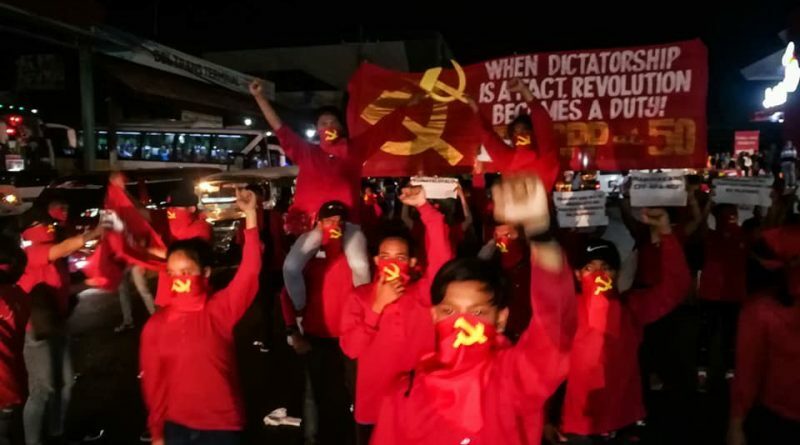 In the 50 years since its reconstitution, the Communist Party of the Philippines has successfully kept fighting for revolution even when the situation seemed to be at a low point. The CPP suffered intense repression in its early years, and soon, the fascist dictatorship of the Marcos regime launched an all out extermination war on the communists. Leading the struggle, the CPP was able to turn the tide and kept a determined focus on revolution even when the dictator was eventually toppled. At the same time, revisionnists were pushing forward their counter-revolutionary agenda in Red China. The Communist Parties of the world suffered the tremendous loss of a forerunner in the struggles of the people of the world when the Red line in China was violently exterminated through a coup and mass repression by the capitalist roaders at the end of the 1970s. Even then, the CPP stayed on course and kept struggling for complete revolution, and not conciliation with revisionism and imperialism. When errors were committed and left and right deviations were becoming apparent, the CPP launched its Second Rectification Movement, and reversed the situation. This constant practice of criticism-selfcriticism and other communist principles for rectification and development in line struggle is a testimony. A testimony that the CPP has proven itself in practice to be the vanguard of the working class in the Philippines and the leading force in the ongoing revolution. In the current century, the CPP has kept leading the struggle in the Philippines. It has attracted young toilers and peasants to take up the fight with renewed energy and carry it to victory thanks to the experience of the Party and the People’s Army. Its efforts to extend the People’s Government and the Guerilla Fronts all over the archipelago have equipped the masses with vigorous and living means for their liberation. Its struggle against the current administration in the Governement of the Republic of the Philippines, proves once again the necessity to put this rotten state to sleep. When the State directly attacks the masses, with extermination and bombing campaigns against Lumad people in Mindanao, or with illegal mass killing and arrests of democratic rights leaders in urban mass organizations, it is only justice that the masses rally behind the leadership of the Communist Party, the only force which brings unbound resolution against the atrocities of the enemy. That the CPP has been able to hold the struggle for revolution for 50 years is an inspiration to all communists. Through open, principled and genuine struggle for unity under Marxism-Leninism-Maoism, we want to assure our Filipino comrades of our intention to learn from this protracted struggle and to develop our understanding of the situation in the Philippines. As a proof of our commitment to this end, we want to announce that for the first time in the French language, a selected number of works from the revolution in the Philippines will be published very soon in the French State by the red publishing house “Red Sun” in association with comrades from the PH movement. This publication will regroup the most important works that have laid out the foundations for the application of what was then Marxism-Leninism Mao Zedong Thought to the concrete conditions of the archipelago 50 years ago. Armed with Marxism-Leninism-Maoism, our universal ideology, we wish to develop and synthesize precisely the same thing, in order to uncover the laws which govern specificities of the revolution in the French State. Victory to the Protracted People’s Wars in the Philippines and in the World! Mabuhay ang ika-50 anibersaryo ng Partido Komunista ng Pilipinas!